AP/Daily Mail UK 23 JAN 2019. Emiliano Sala told his former Nantes teammate he 'feared for his safety' before he took off on his doomed flight across the English Channel. Rescue workers searching for the Premier League footballer have said they are not expecting to find any survivors after his plane vanished on Monday night and Guernsey Police said that the chances of survival were 'slim'. The Argentine striker completed a £15million move to Cardiff City on Saturday before returning to France to bid farewell to his old squad at Ligue 1 side Nantes, posting a poignant photo alongside the words, 'The last goodbye'. The 28-year-old was due to return to Wales in time for training this morning but the Piper Malibu aircraft he was in lost contact near the Casquets lighthouse off Alderney at 8.30pm on Monday night. 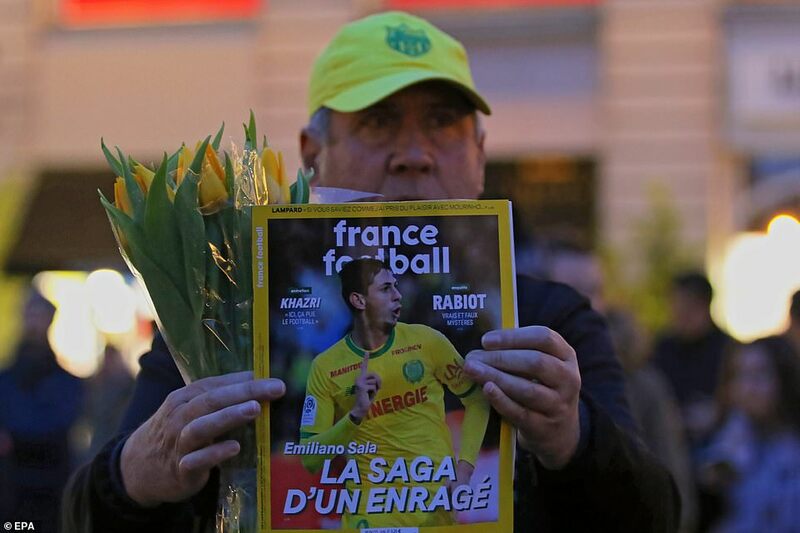 Thousands of people have joined vigils in France and in Wales, and have laid wreaths outside Sala's former club in Nantes and new club in Cardiff. 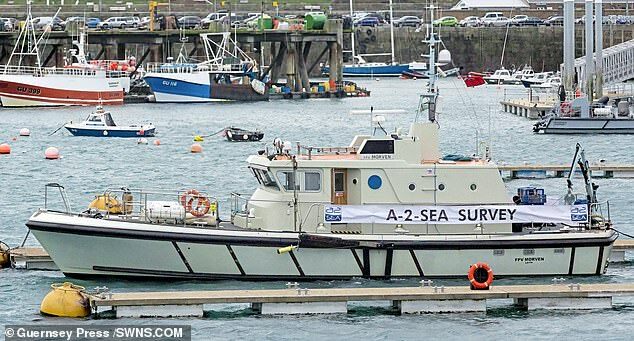 John Fitzgerald, chief officer of the Channel Islands Air Search, said he was not optimistic about finding Sala and the pilot. He said: 'I don't think the coastguard are either. We just don't know how it disappeared. It just completely vanished. There was no radio conversation'. French police, the French civil aviation authority and Nantes Football Club confirmed that Sala was one of the two people on board the Piper Malibu which lost contact near the Casquets lighthouse off Alderney at 8.30pm last night. The Piper Malibu was flying at some 2,300ft and requested descent as it passed Guernsey but was lost off radar as Jersey air traffic control attempted to make contact. It went missing as severe weather warnings about snow and ice were issued across France. The official Nantes FC Twitter account posted a statement and a message to their followers about the missing striker, reading: 'The management and the whole Club are hopeful and it is the whole family of FC Nantes who prays that @EmilianoSala1 and the other passengers of the plane are finally found safe and sound,' read a tweet on the official account. 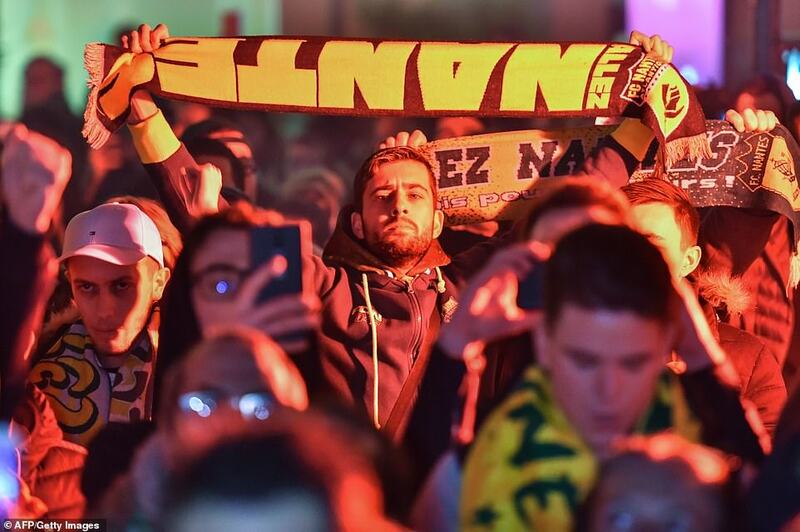 'FC Nantes joins the call of supporters for the rally tonight from 6.30 pm at the Royal Place in Nantes to drop a yellow tulip at the foot of the fountain,' they added in a second tweet. The club later changed its profile picture to a photo of Sala. 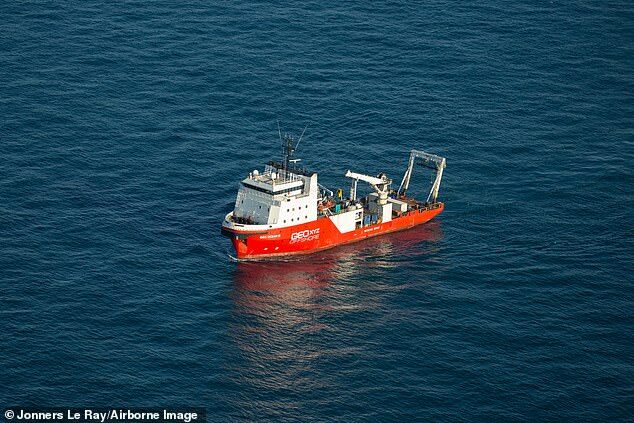 So far more than 1,155 square miles have been covered in the search for the missing aircraft. Mr Fitzgerald said there could be a 'five per cent' chance of finding Sala and the pilot. He said: 'I think with the sea temperatures and the sea conditions the chances of finding anybody alive are reducing all the time. 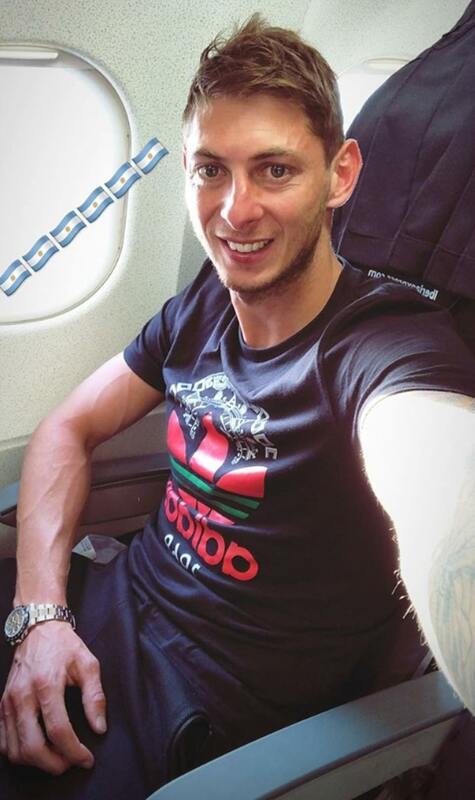 Sala was 'fulfilling the dream of a lifetime' by moving to the UK, and 'could not wait to start playing in Cardiff', according to a friend in France. After joining Cardiff on Saturday, Sala's sister Romina proudly shared the news story about his signing, saying: 'Big brother '. 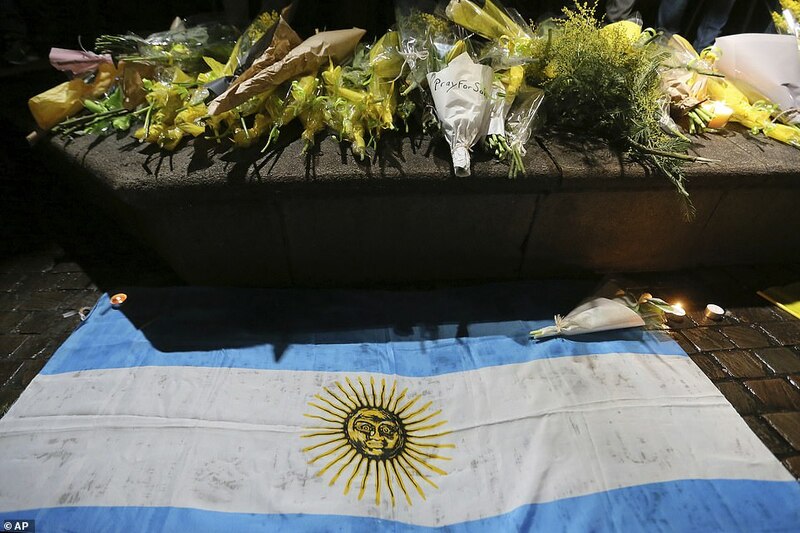 His father Horacio told Argentine channel C5N he was made aware of the news by a friend. He said striker Emiliano, from the small town of Progreso in Argentina's northeastern Santa Fe province, had been excited to be moving to Cardiff and playing in the Premier League. 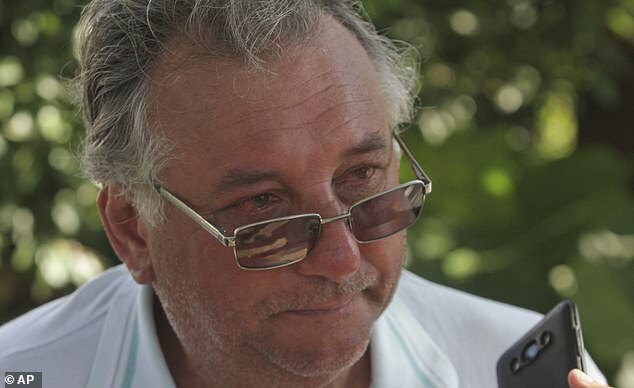 His mother, Mercedes Taffarel, told the same TV station: 'We don't have any more news. The only thing I know is that the plane took off and they are searching for it, we don't know anything yet, they haven't found anything. We are just here waiting, minute after minute. I spoke to him a few hours before he took off. I don't know what else to say, I'm so worried. 'They called me from France to tell me that his plane had gone missing and they were looking for him. 'We are in constant communication and desperate for good news. He was very happy and content with the transfer. He was enjoying the best moment of his career so far. 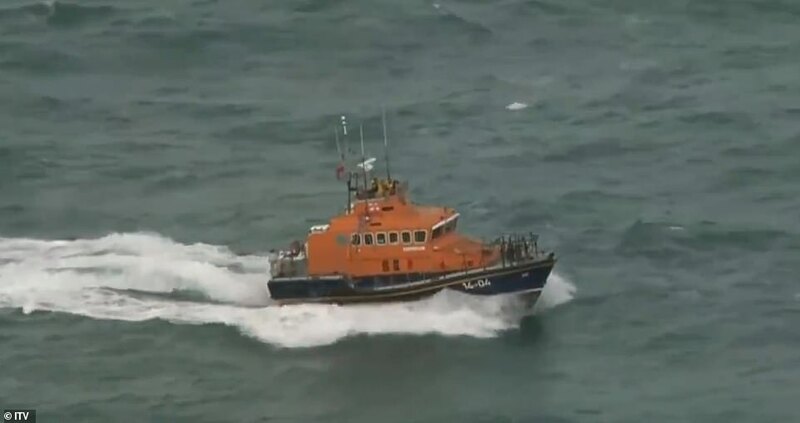 In a statement this evening Guernsey Police said: 'During the course of the 15-hour search, which used multiple air and sea assets from the Channel Islands, UK and France, a number of floating objects have been seen in the water. 'We have been unable to confirm whether any of these are from the missing aircraft. We have found no signs of those on board. If they did land on the water, the chances of survival are at this stage, unfortunately, slim. Two planes and a lifeboat are still searching. A decision about an overnight search will be taken shortly. The Premier League club had signed Sala on a three-and-a-half-year contact on Saturday. Nantes forward Randal Kolo-Muani retweeted Harit's message on his personal account. Sala is immensely close to his family in Argentina, and spoke to his mother who still lives there 'most days', but still believed his destiny was in Britain. He's in touch with his family all the time, mainly on WhatsApp,' said the Brittany-based source. 'His mum often visits, along with his brother and sister. He's very loyal to them all, as he is to everybody. 'The English Premiership was his dream, though. Emiliano is also very religious. 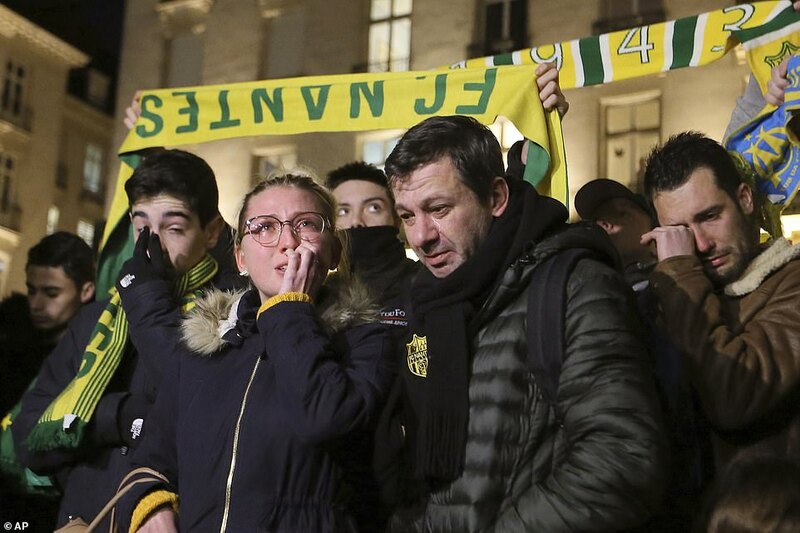 Speaking on TV channel CNEWS, Nantes President Waldemar Kita said today: 'I think that he came back because he wanted to say goodbye to his friends. 'He was a polite, kind and adorable boy, loved by everyone. He was very respectful, very courteous. 'I am thinking about his family and all his friends. For the rest, we don't know yet. 'I am still hoping that it is not finished, that he is somewhere, that he will be there. I have just found about this. 'I was not even aware that he was at Nantes. He is no longer owned by Nantes, he does what he wants. Sala was grew up in Progeso, an Argentine town with only 3000 inhabitants in Santa Fe province, in the centre east of the country. 'As a kid, I watched a lot of the English championship on TV,' he said in a recent interview in France. Sala has a younger brother and sister in Argentina. The brother works as an electrician, and the sister works in a care home. He left home when he was 15 to become a professional footballer, but is immensely loyal to his roots. Sala could have been set to make his debut at the Emirates against Arsenal on 29 January. 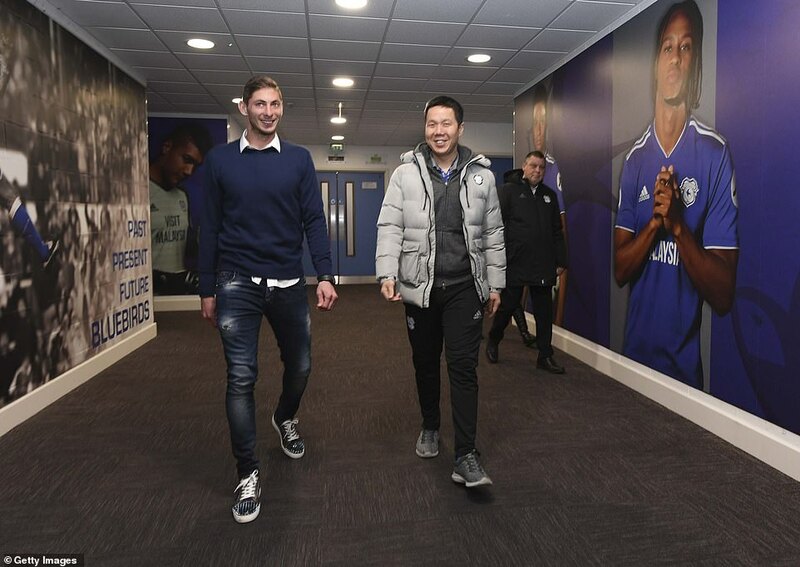 Also, speaking at the time of the unveiling, CEO & Executive Director, Ken Choo, added: 'It's obviously been a long process to secure the services of Emiliano, but I'm very pleased that we're now in a position whereby we can confirm his signature and officially announce him as a Cardiff City player. 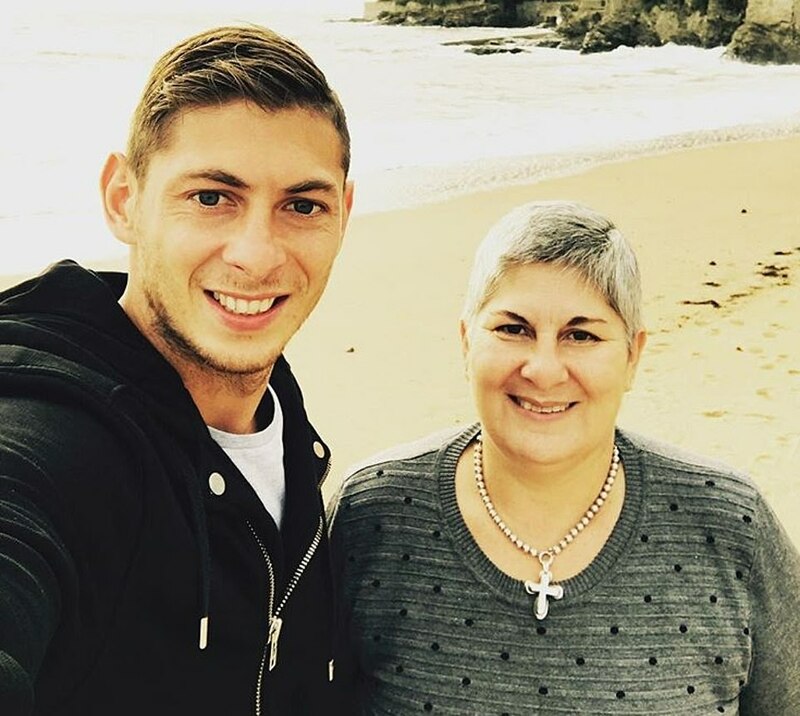 Emiliano Sala's sister has made an emotional plea for the search to continue for her “fighter” brother following the Cardiff City striker’s disappearance. After completing his club record £15million move to the Premier League on Friday night, Sala was on board a Piper Malibu aircraft which crashed in the Channel Islands on Monday evening. The 28-year-old and the plane’s pilot – David Ibbotson– were the only men on board the aircraft and despite extensive searches, neither men has been found. Guernsey Police called off the search on Thursday night with the force rating the chances of survival as “extremely remote”. Sala’s sister Romina has travelled to Cardiff and in front of the media at the St David’s Hotel in the Welsh capital, appealed for the authorities not to give up. She said: “We understand the facts and we really appreciate the efforts. We want to say thanks to the two clubs (Cardiff and Nantes) and everyone who is looking for Emiliano, but my message is please, please, please don’t stop with the search. For me, they are still alive. “It is very difficult to express my feelings at the moment because it is really hard. “We have had a lot of support from the two clubs and I thank all the fans for their efforts, but deep down in the bottom of my heart I know that Emiliano – who is a fighter – is still alive. 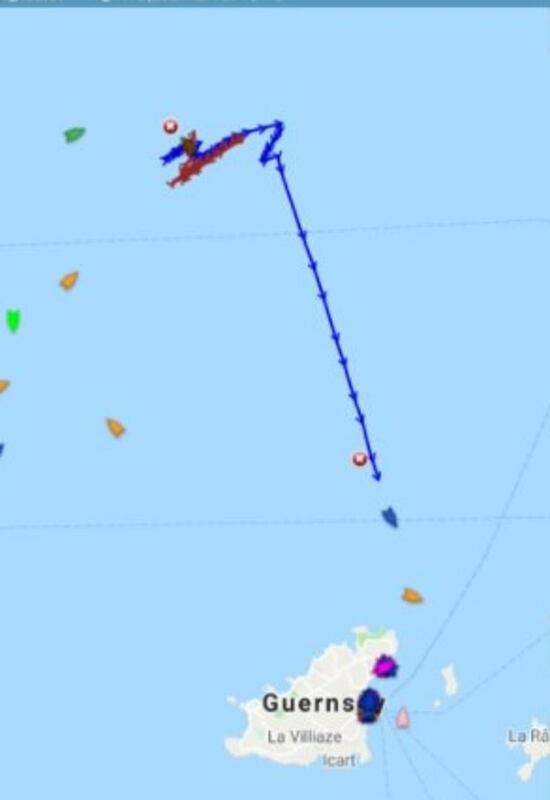 I know Emiliano and the pilot are somewhere in the middle of the channel. Sala had signed for Cardiff last Friday before the deal was officially confirmed on Saturday. 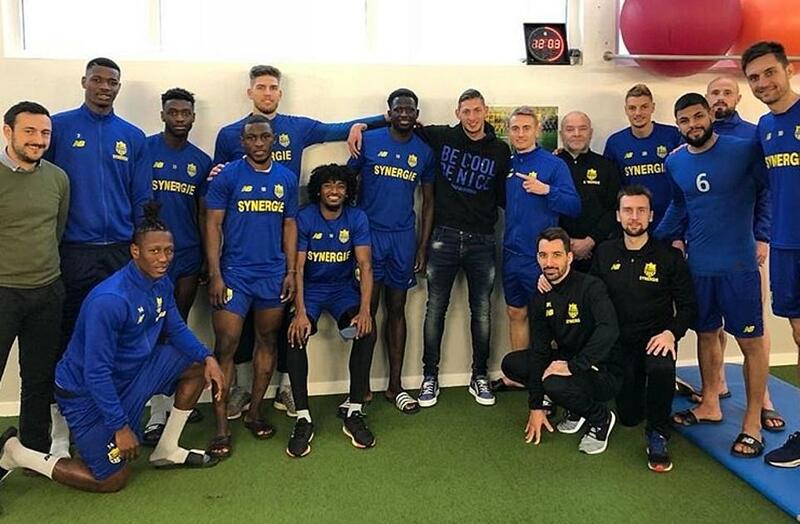 Over the weekend he travelled back to former club Nantes to say goodbye to his team-mates. His plane back to Cardiff from Nantes on Monday never arrived in the Welsh capital. “I am here in the plane that seems like it is about to fall to pieces. I'm scared." Romina Sala added: “The last time I spoke with Emiliano was on Monday before he went to say farewell to the Nantes players. He was really excited to come over to Cardiff and we were in touch all day long sending pictures and messages. “The comfort and support of the people from around the world with regards to the missing of Emiliano and the pilot has been incredible. Please try to be under the skin of the next of kin to try to understand the suffering of this moment. "I understand the effort, but the plea is the same – please don’t stop the search. At the bottom of my heart I know Emiliano is still alive and somewhere in the Channel Islands. “Questions are for another moment. Right now there are two families desperate to know the whereabouts of two people. Questions about how Emiliano went into the plane and what’s happened are for another moment, not right now. “Without knowing what the next steps are, the next step is to go to the search place to try to push it forwards. The plane carrying Cardiff striker Emiliano Sala could have been brought down by deadly ice on the wings, experts have reportedly warned. Sala, 28, was returning to South Wales having signed for the Bluebirds in a club-record £15million deal. He had said his goodbyes to Nantes teammates and staff before boarding the light aircraft. And aviation sources told The Sun that the build-up of ice on the wings could have been the plane's downfall. One reportedly said: “There are reports that the footballer was texting saying the aircraft is shaking and breaking up. Pilot David Ibbotson, 35, had admitted he was "a bit rusty" at the controls of the Papier PA-46 plane prior to the flight and the plane went missing over the English Channel. Both men are missing presumed dead with rescue chiefs admitting there is "no hope" of finding the duo alive. Cardiff have confirmed they were not responsible for organising the transport for Sala. In a haunting audio message sent on WhatsApp before the flight, Sala told pals the plane looked like it was "going to fall apart". Guernsey Police confirmed at sunset on Wednesday they had called off the search for the night, and would take a decision on Thursday morning as to whether it would resume. "After an intensive search using multiple aircraft and one lifeboat over the last nine hours, we have found no trace of the missing plane," they said. "With the light now fading, the search will shortly be suspended for the night. "A decision about whether to recommence will be taken early tomorrow morning. There will be no further updates tonight." The pilot flying the plane has been confirmed as 60-year-old Brit Dave Ibbotson, from North Lincolnshire. Mirror UK, 30 JAN 2019. This is the first picture of wreckage believed to be from the plane carrying striker Emiliano Sala. Investigators said earlier on Wednesday that two seat cushions that had washed up were likely to belong to the aircraft. And Josette Bernard, who lives in Normandy, has taken pictures of a seat she found on the beach four days ago. The Air Accidents Investigation Branch (AAIB) was advised by its French counterparts on Monday that part of a cushion was found on a beach near Surtainville on the Cotentin Peninsula. The AAIB said in a statement: "From a preliminary examination we have concluded that it is likely that the cushions are from the missing aircraft." It went on: "Since we opened our safety investigation on Tuesday 23 January, we have been gathering evidence such as flight, aircraft and personnel records, and have been analysing radar data and air traffic tapes. "We have been working closely with other international authorities and have kept the families of those involved updated on our progress." 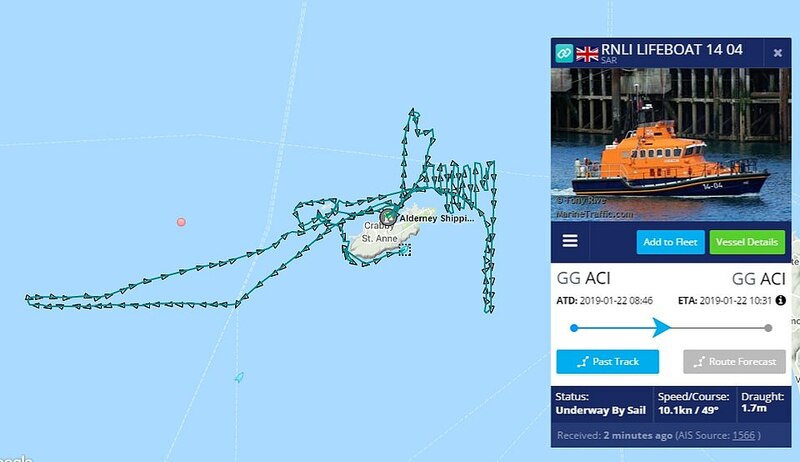 The AAIB has established a "priority search area" of around four square nautical miles and commissioned a specialist vessel to carry out a survey of the seabed. 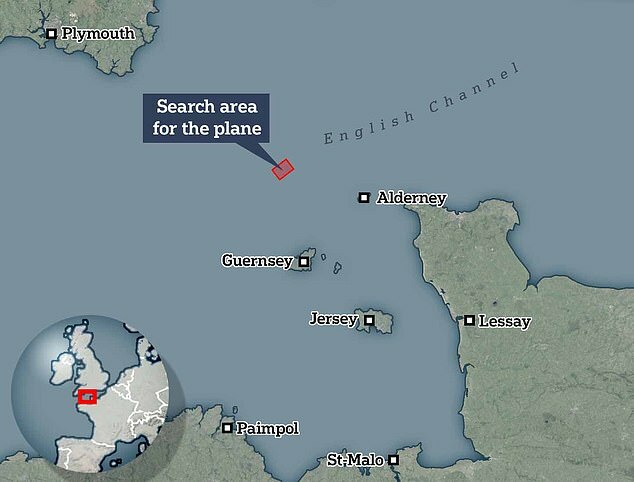 It would not confirm the location but said it is where it believes the aircraft entered the sea. If wreckage is found, a remotely operated vehicle will be used to examine it. 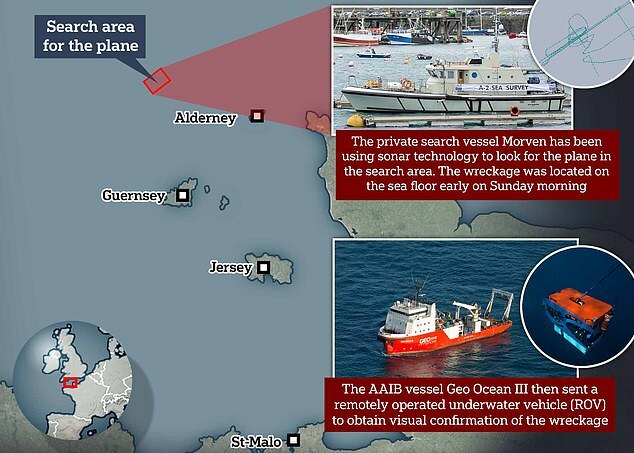 The AAIB said it is aware that a privately-funded search is also being conducted and is "liaising closely with those involved to maximise the chance of locating any wreckage and ensure a safe search operation". 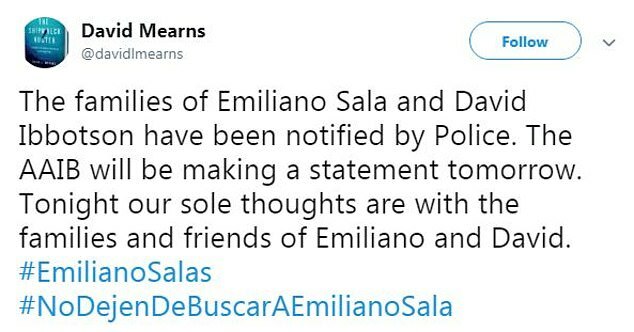 Marine scientist David Mearns is assisting the family of footballer Sala, who had just signed for Cardiff City, with this separate search. He said on Monday it would focus on an area of 25 square nautical miles on the seabed north of Alderney. 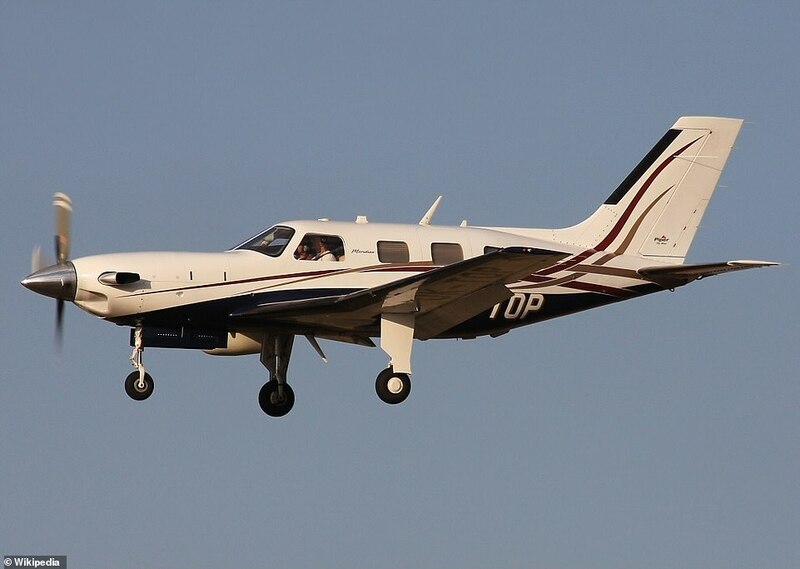 The Piper PA-46 Malibu carrying Sala and pilot David Ibbotson disappeared over the English Channel on January 21 after leaving Nantes in France for Cardiff. Daily Mail UK 4 FEB 2019. Mirror UK, 6 FEB 2019. French club Nantes are threatening legal action against Cardiff over the Emiliano Sala transfer - even before his body has been found. Mirror Sport understands that Nantes sent an e-mail demanding the £15m fee last Thursday and followed up with a legal letter on Tuesday. They are threatening further action unless they get the first payment - the fee is spread over three years - within ten days despite the ongoing search following the Argentine striker’s tragic disappearance. 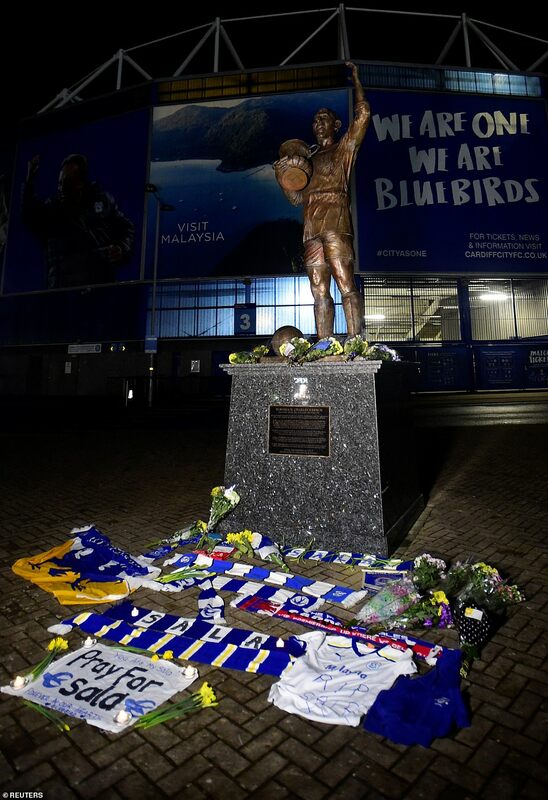 Cardiff have held off until they establish the full facts and to see who was to blame for the tragedy after the plane, the Piper Malibu N264DB, went missing with Sala and pilot David Ibbotson on board two weeks ago. But Cardiff are understood to be willing to meet their full obligations and, while Nantes have done nothing illegal, the timing of the request with the family still distraught with worry has caused upset at the Premier League club. French club Bordeaux are also entitled to a cut of the fee, thought to be 50 per cent after Sala was on their books from 2012-2015 before joining Nantes. Air Accidents Investigation Branch confirmed on Tuesday that their mission to recover the body inside the wreckage is underway. An AAIB spokesperson said: "We are attempting to recovery the body. If we are successful, we will consider the feasibility of recovering the aircraft wreckage. Mirror UK, 8 FEB 2019. 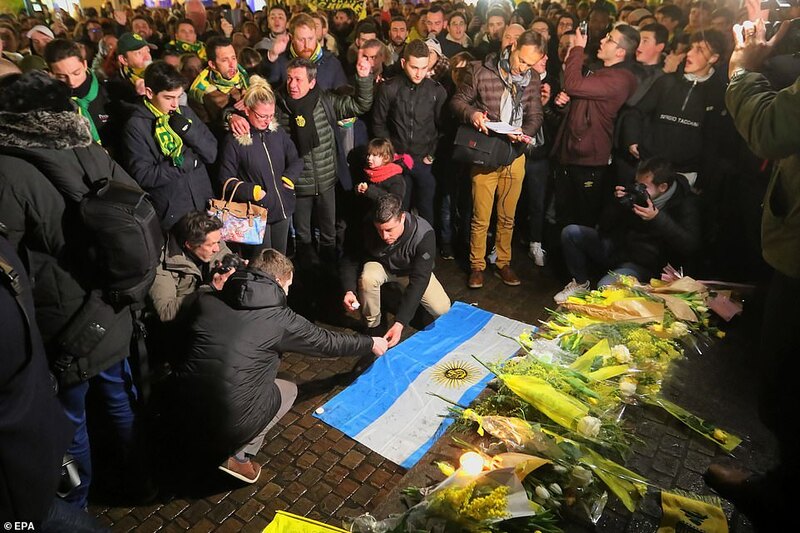 The investigation to find the plane was initially called off after three days, but Sala's family raised the funds to keep the search alive, with thanks to donations from the international football community. Daily Mirror UK, 31 MAR 2019. 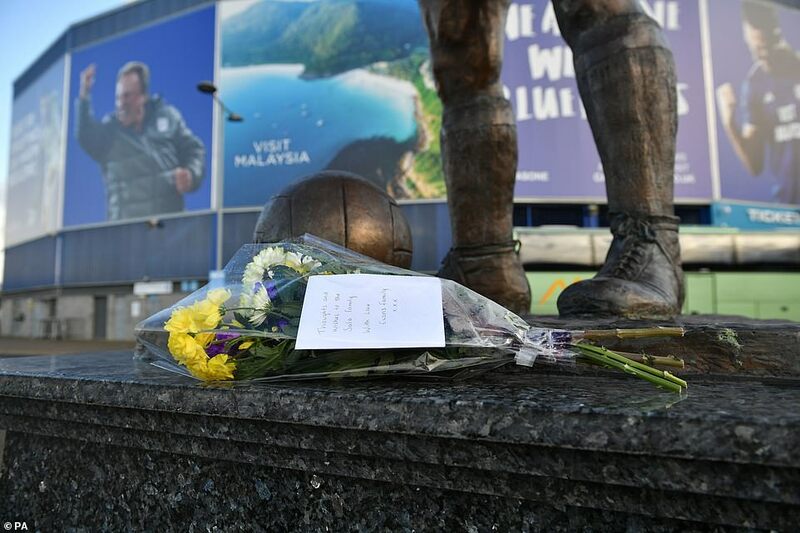 Cardiff City have released a statement demanding those responsible for organising the doomed flight which killed Emiliano Sala are held "fully accountable". In their strongest statement yet, the club have expressed their shock at revelations pilot David Ibbotson was not qualified to fly at night. The BBC claim Mr Ibbotson was colour blind and would therefore not have been able to attain a licence to fly at night. 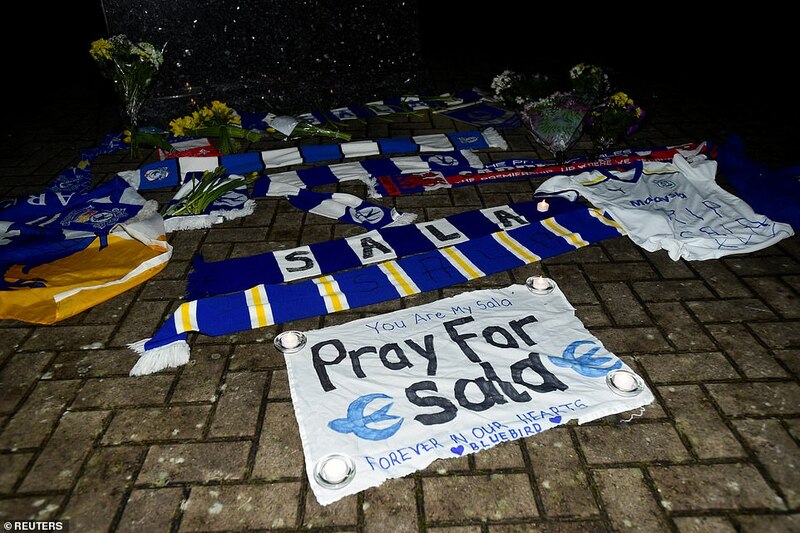 Sala was found on the seabed of the English Channel after the flight from France, where the Bluebirds' record signing had returned to Nantes to say goodbye to teammates and staff, back to South Wales came down. Ibbotson is still not accounted for. In a statement, Cardiff said: "Cardiff City is shocked to hear the pilot, David Ibbotson, may not have been permitted to fly at night. 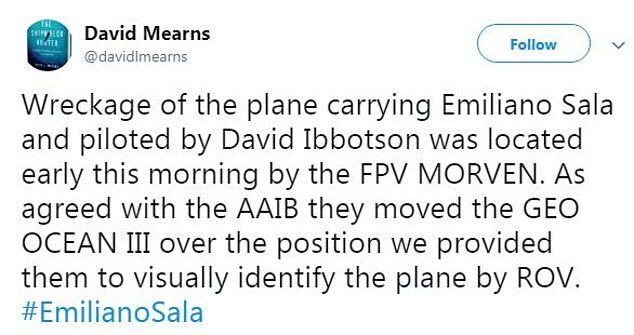 "The club remains deeply concerned that the pilot, and those who arranged the flight, seemingly completely disregarded the rules of flying and put Mr Sala’s life in such danger. We reiterate our support for the Air Charter Association's call for more awareness of and better enforcement against illegal flights." Sala had been signed by Cardiff for £15million from Nantes in January and was set to spearhead the Welsh side's charge for Premier League survival. It has been reported Cardiff will tell FIFA they will not pay the transfer fee due to the forward's death making the switch "null and void".